Interior designer Whittney Parkinson is no stranger to the design world. 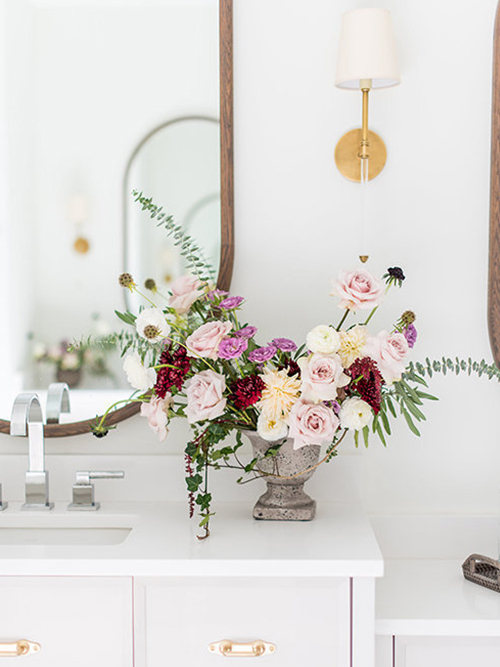 Inheriting a passion for beautiful design from her father, an architect, the Midwest-based designer discovered her calling at an early age. 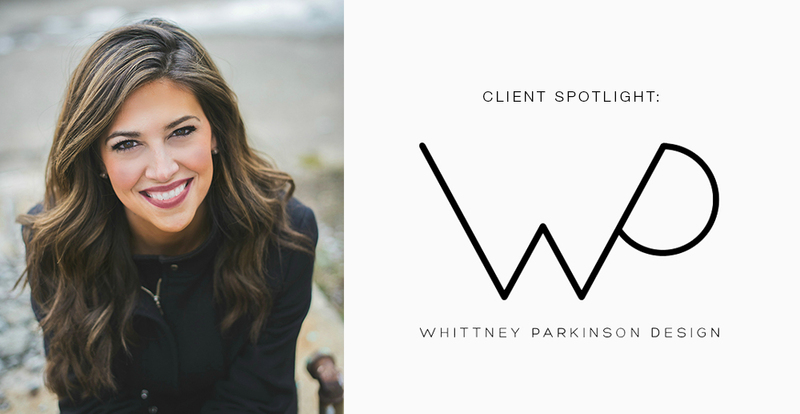 Merging her educational background in art and interior design, she established Whittney Parkinson Design in Indianapolis, Indiana. 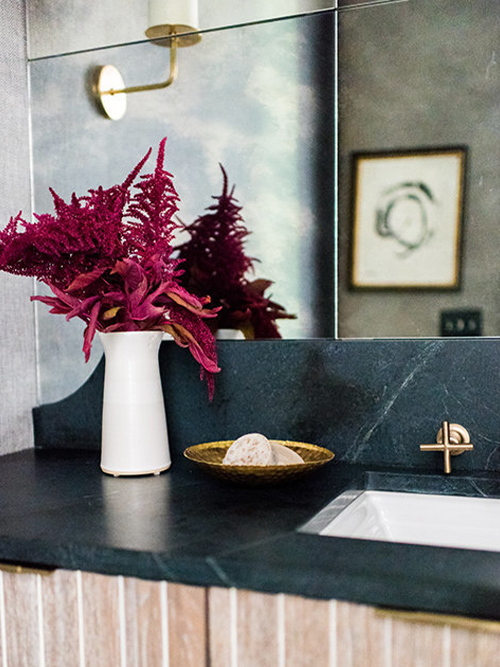 From new build construction to whole home renovations, Parkinson said "I am passionate about creating beautiful and functional spaces and that's something I love to pass on to clients I work with daily. That shared passion is what makes a collaboration great and why I love what I do." Discover how Parkinson has brilliantly incorporated our lighting throughout her projects! 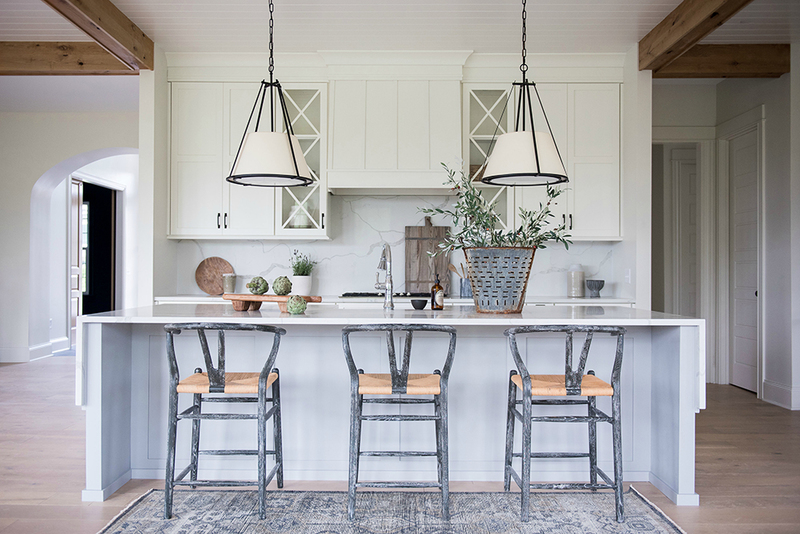 Parkinson utilized clean lines, painted brick, warm woods and industrial pendants to enhance this contemporary cottage-style kitchen. A pair of Sloane Single Shop Lights in Antique-Burnished Brass lend inviting warmth to island. 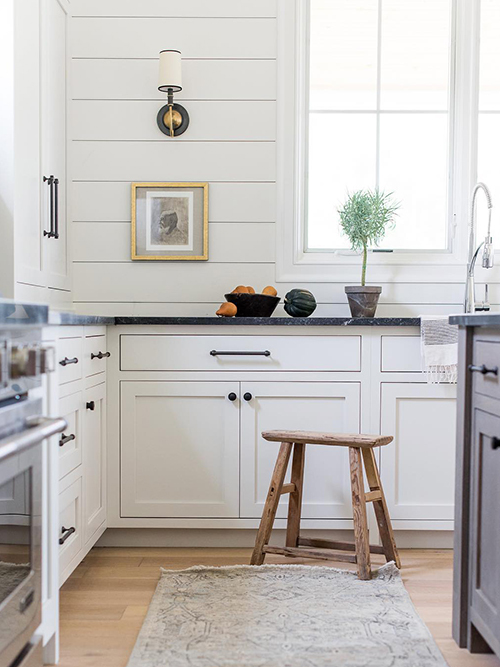 The circular backplate of the Elkins Sconce in Bronze with Antique Brass offers both sculptural and tonal contrast to the linear canvas, while the Natural Paper Shade's Black Tape trim enhances the clean lines of the shiplap backsplash and inset cabinets. 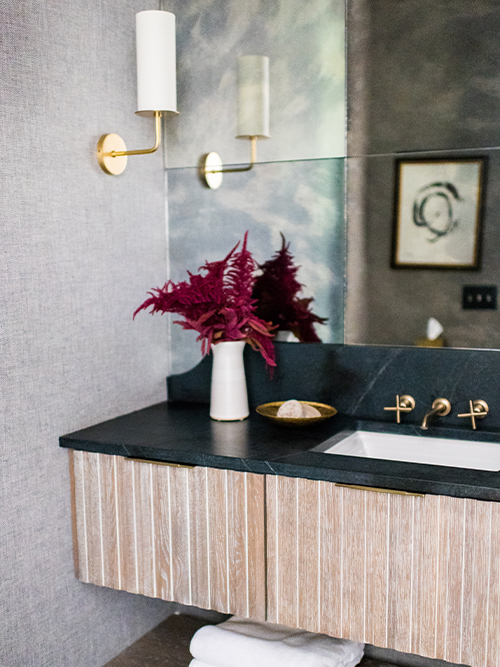 For the master bathroom cabinetry, Parkinson paired earthy hues with brass hardware and lighting, featuring a pair of Katie Small Conical Sconces by Thomas O'Brien. The O'Connor Chandelier's carved Alabaster shade emphasizes the elegance of natural, translucent stone. For the living room, Parkinson showcased her unique ability to not only execute beautiful design, but to create. 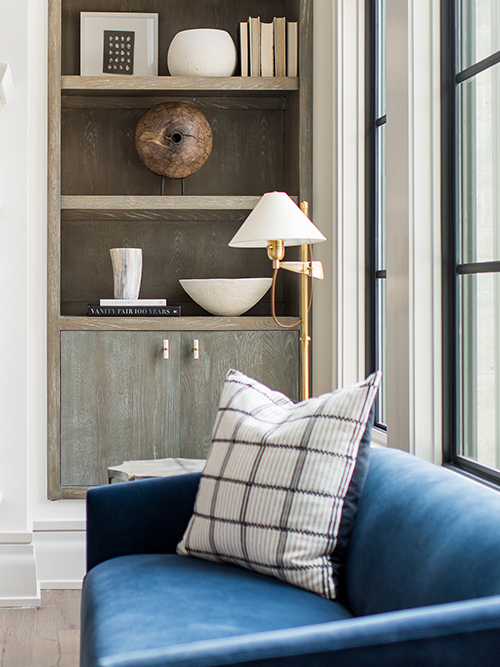 The 18" Cabinet Maker's Picture Light highlights the captivating texture of the pecky cypress, featuring an original charcoal sketch, hand-drawn by the designer herself. 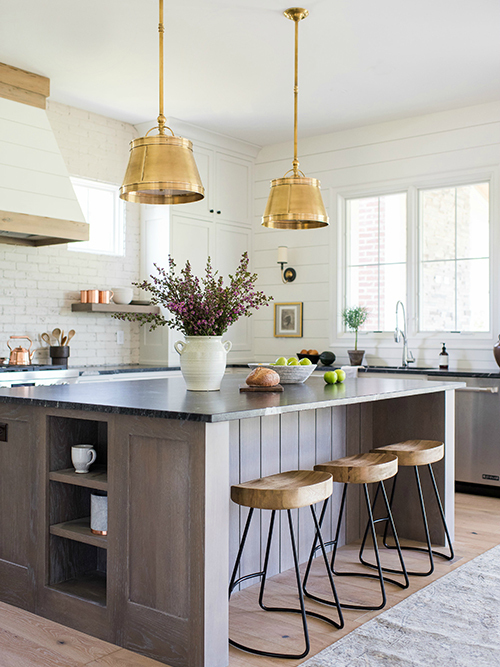 Neutrals reign in this light-filled kitchen. Parkinson elevated her design by layering a variety of tone-on-tone hues, and mixing metals such as Polished Nickel and Brass. 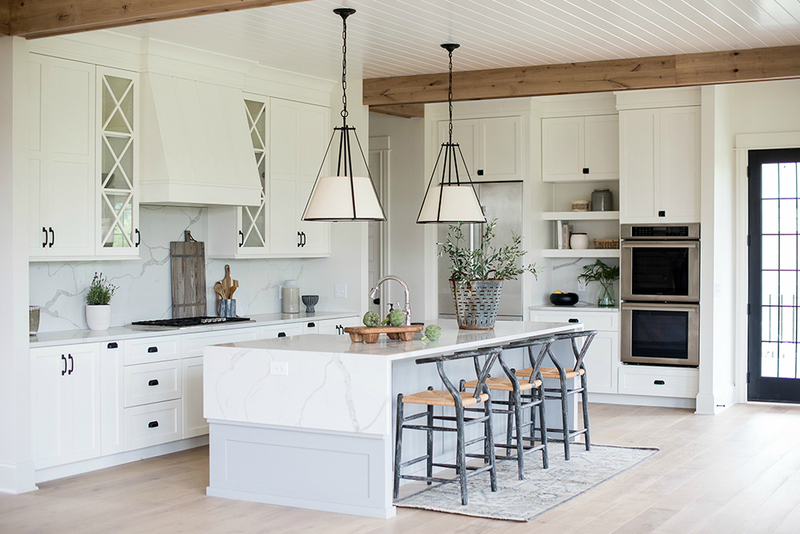 A pair of Dalston Hanging Shades by J. Randall Powers create a soft statement over the island, and a pair of Keating Medium Sconces by Ralph Lauren flank the custom hood. 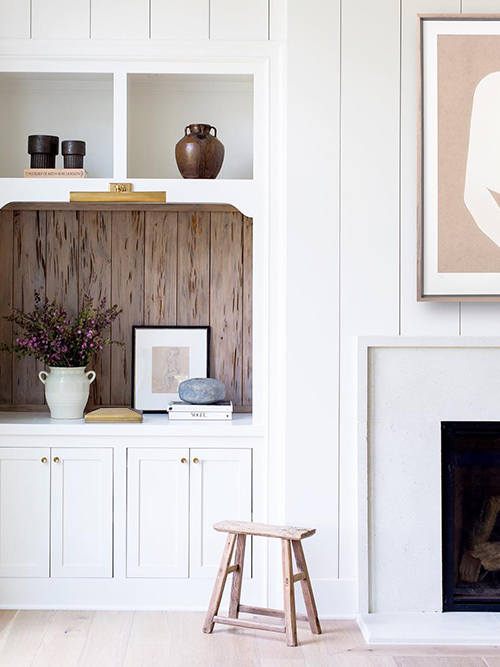 The Katie Small Conical Sconce by Thomas O'Brien illuminates the open shelving. 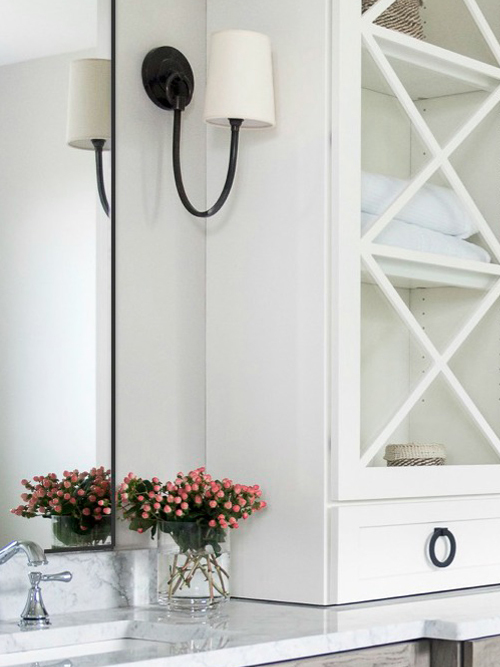 A melange of materials, including soapstone countertops, a wall-to-wall antique mirror and herringbone wallpaper, inject a touch of romance into this powder room. 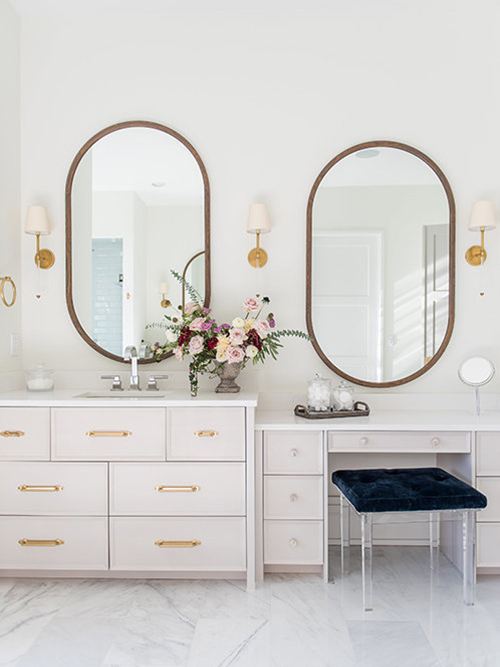 The sleek silhouette of the Larabee Single Sconce by Kate Spade New York brilliantly complements the minimal hardware. Luxurious with a high level of craftsmanship, Parkinson seamlessly blended traditional architectural details with contemporary elements to create a fresh dining room. The Strada Medium Oval Chandelier in Aged Iron by Kelly Wearstler lends an air of modernity to the ceiling. Parkinson intermixed tonal textures to give this space an organic allure. 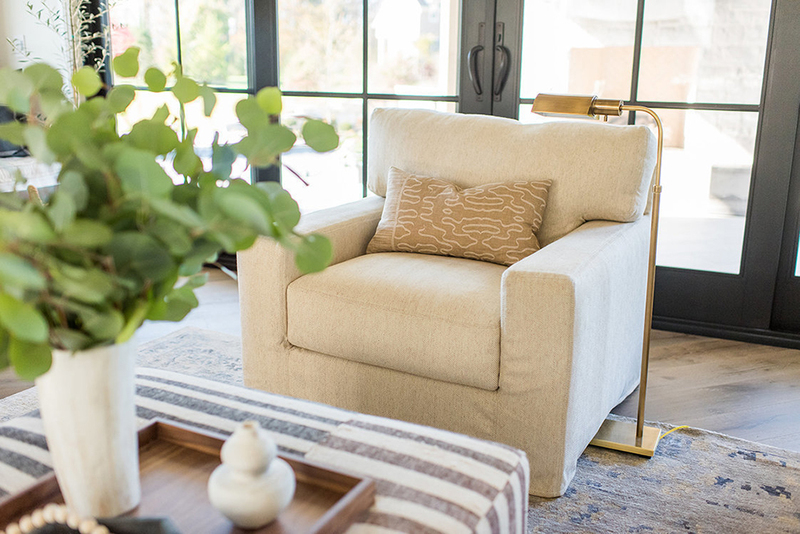 The Studio Adjustable Floor Lamp lends visual warmth to this cozy-yet-chic slipcovered chair. A master of scale and proportion, Parkinson's lighting selections aided her in bringing down this living room's soaring ceiling. The modern open-frame silhouette of the Cubist Large Chandelier by Kelly Wearstler brings sculptural balance to the sleek iron-framed windows . A pair of Gale Library Wall Lights by Thomas O'Brien give striking dimension to the negative space above the custom built-in shelves. The Hargett Bridge Arm Floor Lamp by J. Randall Powers softly accentuates the glamour of the jewel-toned sofa. 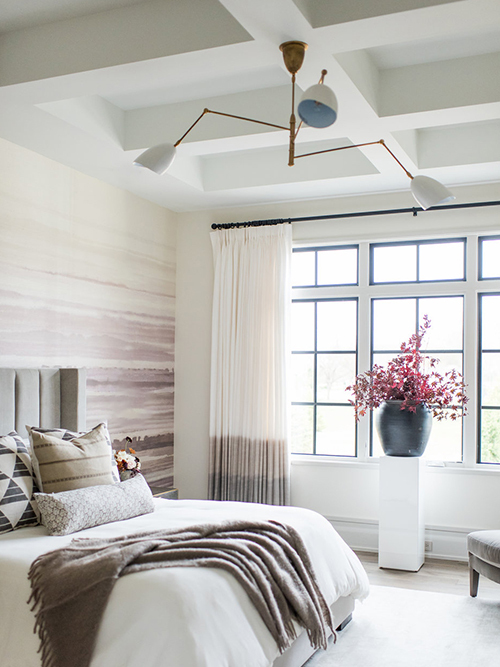 A symphony of dusty hues allows the architecture of this master bedroom to make a statement of its own. The Sommerard Large Triple Arm Chandelier's silhouette echoes the contemporary tone of the watercolor wallcovering. The Aged Iron finish of the Fluted Spire Floor Lamp lends understated drama to the romantic palette. 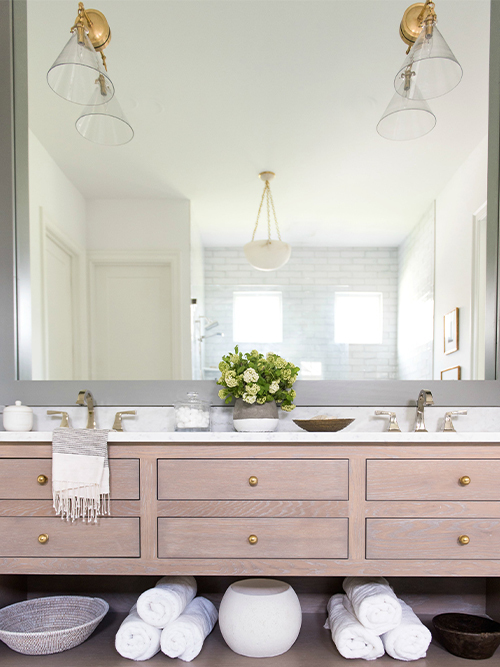 The master bathroom's spacious floor plan amplifies the beauty of natural light. 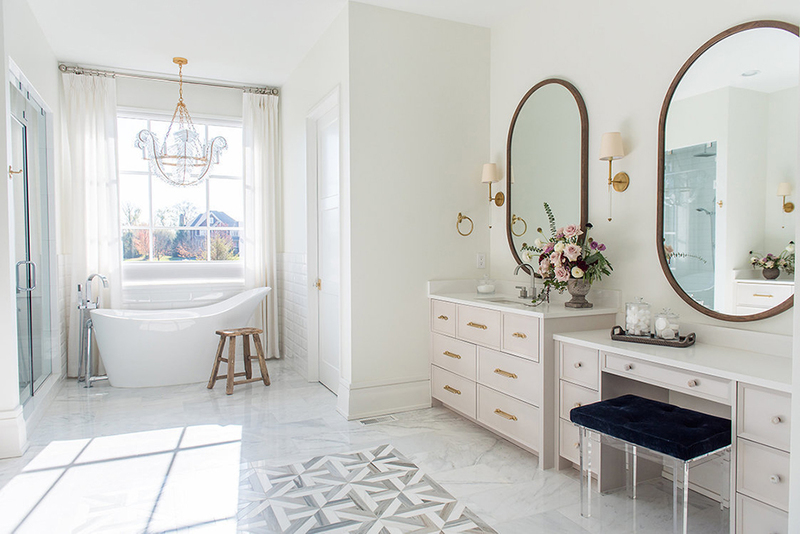 The Calais 34" Chandelier by Niermann Weeks glistens above the sleek soaking tub and a trio of Camille Sconces by Suzanne Kasler lights his-and-her vanities. 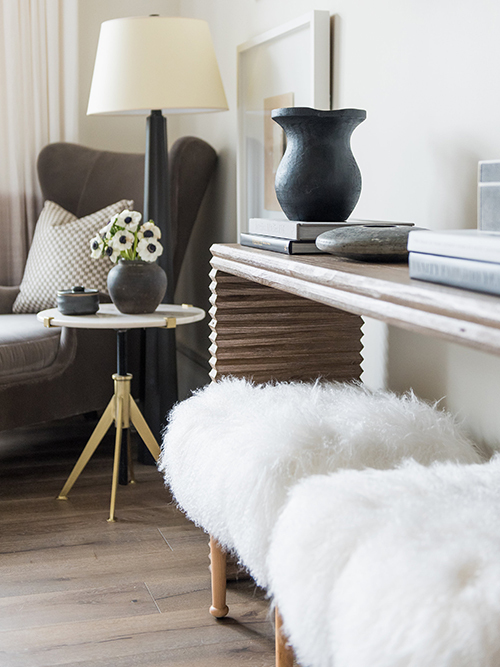 The acrylic arm of the Camille Sconce underscores the legs of the luxe velvet stool. 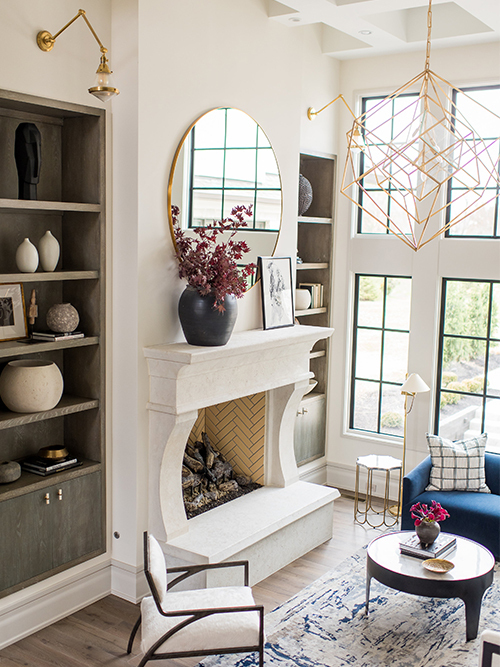 Layering modern and traditional style, Parkinson collaborated with her clients to create a home that was both fresh and functional. 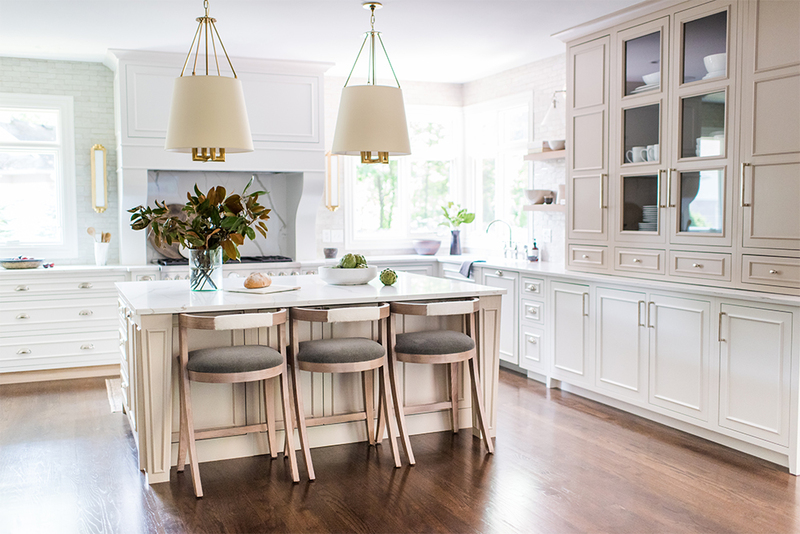 Crisp cabinetry, clean lines and contrasting hardware resulted in a kitchen that harbors balance, depth and harmony. An open floor plan allowed for mirrored symmetry, gaining visual balance and stability. A pair of Aspen Large Conical Hanging Shades by Ian K. Fowler anchor the flawless flow, while accentuating the lines of the glass cabinetry behind. 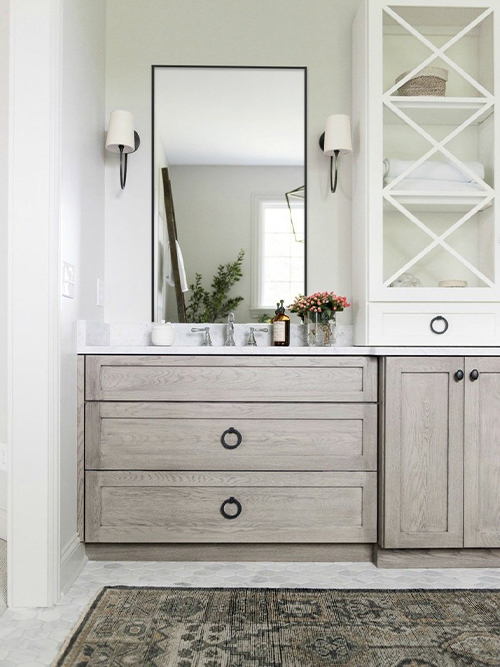 Parkinson carried over a similar aesthetic to the master bathroom - She chose a natural finish for the cabinetry to signal a subtle, welcoming warmth. The elegant curve of the Reed Single Sconces perfectly harmonizes with the slender frame of the mirror. Follow @whittneyparkinson on Instagram and visit whittneyparkinsondesign.com to view more of her inspiring work!